Lionel and Jean in this series of this fabulous show are now married and as always Lionel is the lionish character overprotective of his lady. This double season is a three discer like the others in the series and really struck a chord with me as I remembered the original featuring of the shows on the tele always being a favourite of the family. The interpersonal relationships that are featured on this show are so moving as the ways that the actors interact with each leave you as to no doubt that there is genuine respect for each each as well. When you consider that they were in a relationship when Lionel went to the Korean War and lost track of each other due to a missing letter, later meeting and again and picking up where it left off, the tale is amazing. The great thing about this show is that even though the general storylines are highly enjoyable, it’s the banter between the two stars that is the only thing that really matters. There are a number of new characters introduced, primarily through the addition of the country house given to Lionel by Rocky his father in series 4 and they make for some memorable moments. One that I found hilarious was during the viewing of series 6 with Mrs Bale the housekeeper out in the country. What a grumpy lady! All’s not what it seems out there with all the fresh air, however as Lionel and Jean find out, the townsfolk are not as bad as they initially thought. The audio and video of this title is more than acceptable and there is certainly nothing major to complain about. The aspect is full screen as filmed for television with adequate stereo soundtrack to back it up in Dolby Sound. 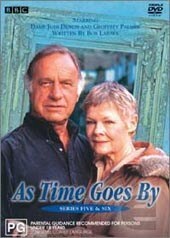 Geoffrey Palmer and Dame Judi Dench are both such masters of their craft and the script is so tightly written that it makes for compelling view of the most enjoyable nature. I really look forward to the other discs in this smashing series.